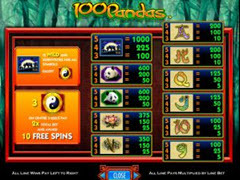 100 Pandas Pokie Review - Play today! Do you love pandas? They are everyone’s favorites and IGT just launched a brand new game with a theme about pandas. It proves to be even more fun and entertaining, especially for those who seek great prizes and nice graphics. This game is all about panda bears and its natural environment. The IGT panda slot adventure should take you to a nice place where you have the possibility to win amazing prizes. The payouts are great and it won’t be long before you get familiar with the symbols and the combinations that could bring you the huge prizes. The graphics are vivid and the sound effects are appropriate to this game. Each spin will make your heart beat fast and it can keep you on playing the game for a lot of time. In case you are looking towards the special features available at 100 Pandas, you won’t have problems finding a multitude of them. The three Pandas symbols are wilds and this means that the panda party will substitute all the symbols except for scatter. The 100 Pandas is also packed with stacked wilds. This is a feature that increases your bankroll significantly. New spins will bring you some staggering amounts of money. Another special symbol that you want to see a lot on your reels is the ones that trigger the free spins bonus. It’s represented by the Ying Yang symbol and it won’t be long before you start spinning the reels for free while keeping your winnings. The free plays can even get retriggered and this way you could get up to 255 free spins. 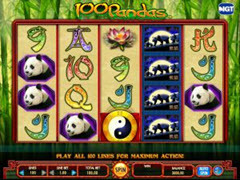 Just imagine the possibilities you have available while playing the 100 Pandas slot machine. It takes just one free spins round to help you get some consistent wins, but if you are lucky enough to hit more than one round, then you should see your bankroll skyrocketed immediately. The game appeals especially to those who seek large wins. You might have to spend some time and money before you hit that big win but will have the possibility to earn some big payouts as a result. You can find many cool and exciting features that are both visually interesting and captivating and at the same time they also count towards bankroll.